I Can Top That: Then he just took my money! My first real date was my senior year in high school (sad i know!) I took this girl that I had been friends with for a while and was really connecting with to a hibachi place. Dinner was fine, and it was very expensive, more than $60 if I remember correctly. After I offered to pay with a debit card, she pulled out a $20 and put it on the table. I proceeded to take it and put it in my wallet. Seemed logical at the time, I payed for 2/3 of the meal, I was a broke high school student what can I say? 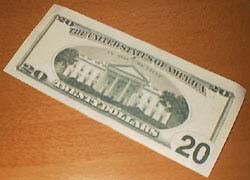 As soon as I put the $20 in my wallet, I realized how weird it was that I just sort of pocketed her money. The last five minutes of the date were very awkward. After we leave, we both head to our cars, I got a text from my friend saying she was at the restaurant and they were all almost done and wondering what I was up to. So I drove around for a minute looking for a new spot, parked and walked in. Right as I came in I hear a loud "Yeah, then he just took my money" from the girl I had just taken out. It was so awkward but luckily I'm at the point now where I can just laugh about it with her, but it was very embarrassing because they all saw me right after she said it, and there was no way to pretend I didn't hear it.